The enthusiasm was understandably muted, the smiles strained but the mood was defiant. Let's just say that friends, supporters, relatives and civil servants who came and saw, wished Charles Angelo Savarin was sworn-in as Dominica's eight Head of State under more amicable circumstances. So, Charles Savarin is the new President and there's nothing the opposition can do about it-for now. Don't forget there's been talk about court challenges of Savarin's Presidency and boycotts and making life for the new President unbearable because of his past political life, because of things he said and did over the past three decades, because he's, as far as the opposition is concerned, a round peg in a square hole. In his speech at the Swearing-in of the President on Wednesday at the House of Assembly, Prime Minister Roosevelt Skerrit acknowledged that "the road to the presidency was not as smooth" as he would have liked and he hoped that Dominicans will soon appreciate the "quality and unquestionable ability of Charles Savarin". Savarin was Skerrit's third choice for the post; the first two withdrew, the first one under pressure from the opposition and the second because she is a dual citizen. During his inaugural address, the new President talked-the- talk about the debate about his suitability for the post of Head of State is being rather healthy in a democracy but that "we must not give the impression to persons at home and abroad that we are a people at war with each other". In other words we must debate, we must not fight and don't try to intimidate the President with threats of civil disobedience. "I want to say to you the members of Parliament and to all citizens and residents of Dominica, that I assume the office of President without malice or ill will toward anyone, without fear of intimidation, and with respect for the traditions, laws and Constitution of Dominica which I am sworn to uphold," he said. 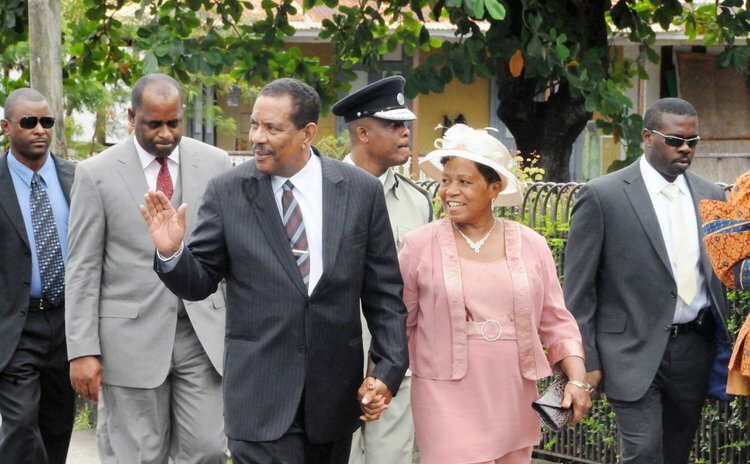 But President Savarin has quite a U-turn to navigate if many, many Dominicans are to accept him as the President of all the people. He didn't have a good beginning because even at the swearing-in ceremony prayers were offered by two religious leaders with deep and open affiliation to the ruling party. And Savarin, as usual, lectured the opposition about their role and function. "The democracy that we cherish is underpinned by this Rule of Law. It flourishes where societies and individuals accept and appreciate diversity of views. It is nurtured by the cut and thrust of informed debate, and devalued when deliberate misinformation, innuendo and character assassination gain supremacy over fact, respect, and the common courtesies practiced in civilized societies," he said. "The democracy that we want to refine and make more efficient, must continue to be based on the expressed will of the majority of the people. This does not mean that the minority has no voice. The minority and the majority both have access to the parliament, to the media, to the courts and to the political platform. In any true democracy, the voice of the minority can be an important input in the process of moving the society forward, and in such a manner that all views and opinions can be heard and considered. In the final analysis however, decisions will be arrived at by the majority of those participating in the process". He added: "In the Parliament we are trustees of the people. The discharge of this entrusted responsibility is not to be taken lightly. While the majority has the responsibility to propose and to decide, the minority has the responsibility to analyze, and where they disagree with the majority to put forward alternative proposals. They must also see themselves as an alternative or replacement, in due course, to the Government and not as a second or parallel government. This means that the minority must at all times be well informed on the critical issues of the day. It is only if they so inform themselves that they will be able to advance credible alternatives to the important issues and so engage and even persuade the majority to reflect upon their points of view and modify and/ or adjust their decisions where such modification can be shown to be in the interest of the people."